This may be a first for Dangerdog Music Reviews, considering a metal band from Bosnia. 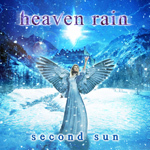 This is Heaven Rain and their latest album Second Sun, a quite entertaining platter of melodic power metal led by the vocals of Miona Graorac. Unashamedly, Heaven Rain wears their influences on their sleeves, going for the epic sound of European and Scandi power metal akin to Kamelot, Sonata Arctica, Nightwish and Ayreon. Fundamentally, they get it. Their sound has depth and breadth, with strong vocal arrangements, guitar jams and synth solos, over melodic hook-laden arrangements. There's no attempt at modern metal trends and its harshness, everything is bright and refreshing. While all the songs have merit, my top picks would include Dreamless, Second Sun, When Day Fades to Dark, and symphonic instrumental At The End of Time. What's most curious is Miona Graorac's vocal style. After more than a few spins, I wasn't sure if I was truly listening to a female vocalist. I kept checking the greats, wondering if one of the men was also contributing to the leads. No such luck. Graorac's are nothing akin other contemporaries in female-fronted metal bands, so don't expect Tarja or Charlotte Wessels, for that matter. Actually, it's a quite interesting and refreshing style. Heaven Rain's Second Sun is a strong album of melodic power metal, conventional, yes, but quite entertaining and satisfying. Easily recommended. Heaven Rain's Second Sun is a strong album of melodic power metal, conventional, yes, but quite entertaining and satisfying.